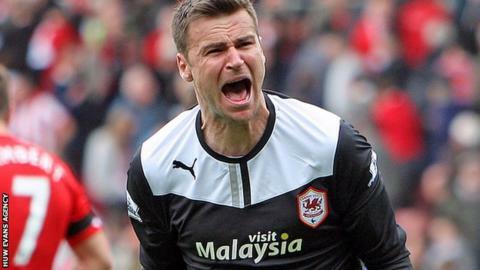 Scotland goalkeeper David Marshall says he feels privileged to have been named Cardiff City's new captain. Marshall, 29, permanently takes over the armband from Mark Hudson, who was sold to Huddersfield Town. It shows further commitment to the Bluebirds after Marshall was linked with a move to a number of clubs during the summer transfer window. "It's obviously a great honour to be captain," said Marshall, who has been a Cardiff City player since 2009. "The gaffer [Ole Gunnar Solskjaer] spoke to me a few days ago obviously with Huds [Mark Hudson] leaving the captaincy has been made permanent." Marshall, who has returned to Cardiff after a fine performance for Scotland in their 2-1 defeat by Germany in a Euro 2016 qualifier, said he was disappointed to see Hudson leave after five years at the club. "Huds has probably been one of the best if not the best captain the club has had, so to follow someone like that is a big honour," said the 12-times capped Scot. "[He was my] roommate over the last three or four years. I wish him well and he was a great addition for Huddersfield." On his commitment to Cardiff, Marshall said: "I was happy to remain here and try and get us back up to the Premier League." He begins his reign as skipper by leading the Bluebirds in their Championship home clash against Norwich on Saturday. Marshall said he has plenty of experienced help in the side as Cardiff City attempt to launch their bid for promotion. At the moment the Bluebirds are in ninth place in the Championship with two wins, two draws and one defeat from five games. The side now face the prospect of seven games, including a Capital One Cup tie, coming up in the space of 21 days. "We have enough strong characters out there. Gunnar [Aron Gunnarsson] is the captain of Iceland and Whitts [Peter Whittingham] is very experienced," reflected Marshall. "We have got some though games - three games in a week. We have had a reasonable start without playing really, really well. "We will definitely be looking to be in the top six minimum before we break up for the internationals again."